The Finwing Air Titan 6kg Metal Gear Servo, can be used for any application requiring a proportional servo with a travel of 180 degree, requiring high amounts or torque (6.5kg @ 6.0 volts). This servo is recommended for the Finwing Air Titan on Aileron and Steerable Nose Gear functions. With the fitted high torque motor and metal gearing, makes this servo ideal for this application as the control surfaces on the Air Titan are very large, presenting a high amount of wind resistance under full deflection. This servo offers a huge amount of power and degree of centering accuracy which gives you precise control and no blow back under nominal flight conditions. The servo will operate on 4.8v - 6.0v but will provide higher torque and speed at 6.0v. 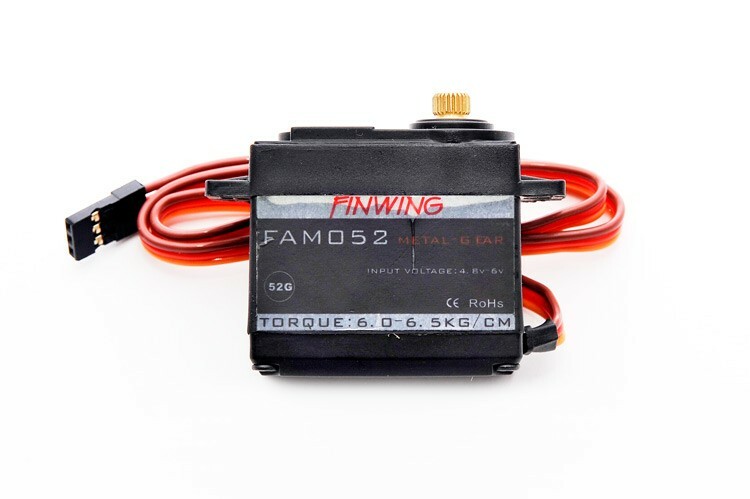 If you are running multiples of this servo on your electric aircraft we recommend using the external Finwing Air Titan UBEC which will supply a constant 6 amps to your servo's, more suitable than the industry standard 3 amps supplied from a regular UBEC or ESC BEC. The servo comes supplied with a variety of plastic servo arms to suit your needs, as well as all mounting hardware and screws. A standard 3-pin servo plug is used for connecting to your receiver (no tab).